Serena set to Slam again. Picking a winner of the Venus Rosewater Dish has never been as easy as this. Maybe they should start calling it the SERENA Rosewater Dish! For I believe Serena Williams will win her SIXTH Women’s Singles title at SW19 this year. I will go further. She will not only win Wimbledon, she will win the US Open and the Australian Open in January. I believe the American will complete her second ‘Serena Slam’ holding all the four Grand Slam titles at one time 11 years after her first. My confidence just mirrors Serena’s own self-belief. As long as she stays fit and motivated, I can’t see any of the other women getting close. Serena is that far ahead of the field. Two months ago, I sat at the back of court at Delray Beach in Florida watching Serena play a Federation Cup tie against Sweden. As a commentator, I’m normally sat high up in the stands, but on this occasion I was almost within touching distance. At that range, you really appreciate the pace and power of her game. By co-incidence, sitting almost next to me was my ex-wife Chris Evert (happily we are on very friendly terms). I couldn’t help but think back to the days when I was working with Chrissie on the practice court, helping her battle for supremacy with Martina Navratilova. And with all due respect to those two ladies and an acknowledgement that racket technology has moved on watching Serena was like being on a different planet. The way she was hitting the ball was frightening. By comparison, Chris and Martina played powder-puff tennis. Thirty years ago, Martina (unfairly) was seen as a kind of Amazon figure in the women’s game. I can tell you she was a lightweight by comparison to Serena in terms of the power generated on court. It’s very clear that in the last year, something has motivated Serena. She is now totally fired up and focused on her tennis. That wasn’t always the case. In fact, at times Serena was virtually a part-time player, devoting time to fashion design, acting and other projects, and turning up at Grand Slam events as a distraction. She has re-directed her focus onto tennis, and I’ve never seen her look or play better than in the last few months. Serena looks happy on and off court, and I assume that is down to her relationship with tennis coach/boyfriend Patrick Mouratoglou. Whatever the reason, it has worked wonders. She looks to have lost a bit of weight, and she has never been more mobile on court. Just as important is her mental attitude. 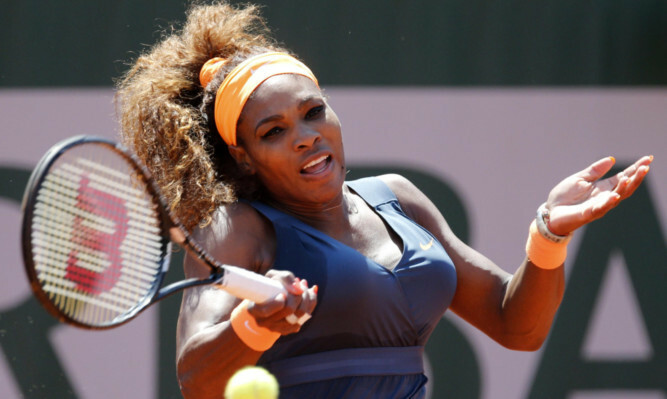 In the past, Serena allowed line decisions and other distractions to upset her concentration. A few times she completely ‘lost it’ on court. Now Serena seems far more composed. She is enclosed in what she’s doing. I always got on well with Serena and Venus’s father, Richard. I remember him saying that he’d be shocked if either of his girls carried on playing tennis after the age of 26. Serena is now 31, and at the very peak of her career. She has 16 Grand Slam titles and wants more. I know that Chris and Martina are proud of their joint achievement of 18 Grand Slam singles titles each in the open era second only to Steffi Graf’s 22. Sorry, ladies, but you are about to lose that position in history.